A common problem that tends to occur in a company that has grown quite a bit is the classic ‘silo’ system. This is where you end up with separate systems for sales, accounting, marketing, and email, and those systems don’t communicate with each other. In this situation, the ERP solution tends to function as its own island. Other solutions to manage sales and customers are added, and then you add yet another system to handle marketing and another to handle email. Pretty soon you’ve got several different solutions functioning on their own, with little to no connection between them. It’s not uncommon that when Encore engages with a prospect, we see this type of silo issue where information is not shared between each system. This results in team members being unable to trust what’s in the system because they feel there is no one source of ‘truth’. You don’t have a single source of truth. You have some current information in one spot, and some current information in another spot. Otherwise known as ‘time-capsuling’, efforts are put in to record information in several different systems for the future benefit of others in the organization. Once sales has a commitment from a customer, they are then dropped into fulfillment and accounting. Sales has no visibility into that world, and there’s no feedback loop if something goes wrong. A particularly insidious sign is missed opportunities to build upon customer relationships. Customers leave signals and clues about their buying behaviour all over the place. If you’re working in silos, you are likely missing out on some important cues. When you don’t have integration across departments, you end up doing a lot of manual work trying to find answers that are not readily available to you. Would the team be able to react fast if an opportunity for growth presented itself? There’s a good chance that your competition has adapted to a more modern means of integrating their systems and processes. They are moving faster, and not missing opportunities like you might be. They’re not wasting time duplicating effort or trying to track down information in different systems. If you don’t address this problem, you will get left behind. What is Dynamics 365 Anyways? Maybe you’re fairly new to Dynamics 365 and are unsure what we mean when we talk about integrating Dynamics 365 to your ERP. Historically, CRM (Customer Relationship Management) referred to sales, customer service, and a little bit of marketing. Now it’s so much more than that, Dynamics 365 is really anything that your accounting system isn’t. A lot of development has been done on the Dynamics 365 platform recently. It now includes functions like project service automation, field service, and talent management for HR. What Programs can be Integrated? All Microsoft ERP platforms have a connector to Dynamics that stitch the systems together fairly seamlessly. 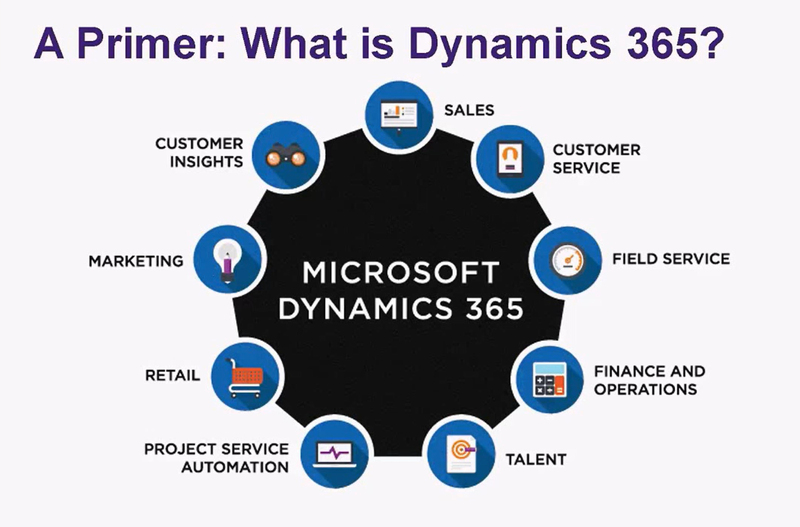 Even a non-Dynamics ERP or a database that you’ve built yourself can be connected to Dynamics 365. With the advent of Microsoft Flow, there are now more than 230 applications that can be connected to Dynamics 365. These include non-Microsoft products like Gmail, social networks, and marketing platforms. As your Microsoft Partner, Encore can help you explore the integration possibilities that could lead to smoother processes and an entrenched feedback loop. There are common challenges that come up in businesses every day that could be solved with integration. A salesperson creates a quote for a customer, and they are unknowingly working off of outdated information like price lists or inventory. A services organization with billable resources needs to do their invoicing at the end of each week. But first, dozens of billable resources have to participate in the long, drawn-out process of submitting timesheets in a separate system not connected to accounting. A high-volume customer is extremely late on payment, but the salesperson has no idea that this customer is now a credit risk and they continue to push orders through. Salespeople who work on commission have sales goals based on shipped orders. They need to see where they’re tracking with their sales goals, but they don’t have access to real-time stats showing how they’re performing against their targets. Integration possibilities within Dynamics products are all handled a bit differently. In the case of Dynamics GP, Encore uses third-party products like Scribe and SmartConnect which are mature, established, and reliable. For Dynamics NAV or Business Central, there is a built-in connector that enables a very simple integration process. There is an integration solution for just about any accounting system out there. First you need to identify those processes that would really benefit from an integrated approach. A good suggestion for identifying them is to look at repetitive, consistent, processes that don’t require any kind of judgment call. It’s important to choose processes that with very rare exception are always done, and this efficiency can provide a measurable benefit to the company. Once the door to accounting is opened, you have to become vigilant about protecting data integrity. The accuracy of the data entered into CRM lies with every user who may be entering information. The responsibility for accurate data entry may be with accounting for some fields, and with sales for others. It’s important to create a natural workflow that keeps everyone efficient and effective and doesn’t slow the business down in any way. There is a large range of services when it comes to integrating CRM with your ERP. In some cases it may be simply a matter of syncing accounts in NAV which might take only a day or two with the NAV connector. Then there are more complex integrations that require a much more thoughtful approach that could take up to 100 hours to complete. Typically, an integration process takes six to eight weeks on the high side because there’s a lot of necessary testing and verification. We will rely on your busy accounting staff to help us through that process. Encore will work within the boundaries of how quickly you can move, react, test, and ultimately become trained up on the solution. Ongoing maintenance also needs to be considered. When you have data travelling between systems, you might have the odd problem that crops up. We encourage our clients to choose an Encore Care support package to make sure that the integration is reliable and rock-solid. I hope this gives you a bit of an idea of how an integrated process can look when it spans several different job titles and job functions. Hopefully this gives you a sense of the possibilities when integrating CRM with ERP. If you have any questions about integration with Dynamics 365, please connect with us.